The author of this post is stepping in (just this once!) for our resident DMA baker and Culinary Canvas blogger, Sarah Coffey, whose baking talents we are all missing during her maternity leave. Last week when the weather got toasty, I started to daydream about my favorite pseudo-holiday: Christmas in July. 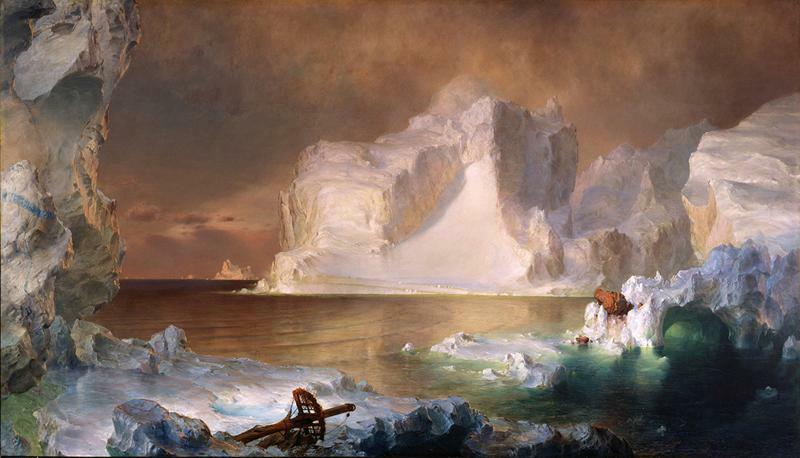 Instead of donning a goofy sweater and decking the halls, I decided to mark the occasion with a trip to visit our Icebergs painting, and a little Christmas baking. (Actually, as you’ll notice when you get down to the recipe, it was a lot of Christmas baking). Spritz cookies, a Swedish butter cookie often baked during Christmastime, are one of my favorite holiday treats. I love the cookie’s buttery richness, slight almond flavor, and the thumbprint full of preserves in the center. There’s also something very satisfying about piping the dough into shapes, one by one. The Spritz cookie recipe below is a commercial one, taken from a baking class I recently finished through El Centro Community College’s Bakery/Pastry Arts program. The recipe’s yield is high, but since this baking adventure was inspired by the holiday spirit–and the sharing and overeating it inspires–I thought a few extra (dozen) cookies would be a welcome thing! Using the paddle attachment of a stand mixer, cream butter and sugar at low speed, blending to a smooth paste. Add eggs and almond extract in at a low speed. Sift in flour, baking powder, and salt. Mix until just combined. Using a pastry bag and a large #5 star tip, pipe dough onto parchment sheets, garnishing tops with pieces of fruit, nuts, or preserves of any flavor. Place cookies in freezer for about 30 minutes to set shape. Put in a 350˚F oven and bake approximately 8 minutes, or until the edges are just beginning to brown. 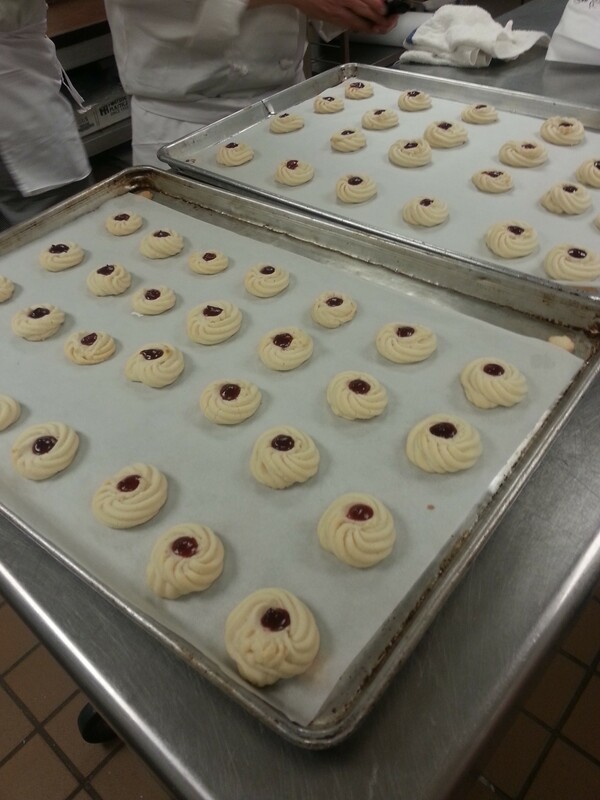 And because this is a Friday Photo post, below are some more images of my semester of baking at El Centro! ← Friday Photos: Welcome Baby Rhys!